*"Ray (Christmas Farm) and Frazee (The Boss Baby), two big talents beating as one, assemble a cast of junior philosophers to help them muse on why stars—as celestial bodies, as shapes, as symbols, as talismans—hold so much meaning and mystery for us...while the prevailing tone is contemplative, it’s more quirky than languid, capturing the delicious freedom of Ray’s mind at play. Her prose wanders in the best sense of the word, and Frazee is happy to connect the dots and explore the detours, showing readers how stars can turn sticks into wands, cheer us up, or remind us, gently, of how much of the universe is beyond our grasp." *"Ray’s simple ode to stars is an engaging concept book.... Frazee’s deft sketches of a diverse array of young children, scattered on white or mottled blue pages, are both playful and evocative.... [Stars] celebrates everyday experiences of children, prompting observation of the world around us, and it’s beautifully structured for eliciting children’s conversation and response. There are bits of humor and poetry, an engaging cast of players/star watchers, and many possibilities for pairing the book with crafts, activities, and other books, too." "Most of us rarely take time to notice the twinkling lights that adorn the sky on clear evenings, but Mary Lyn Ray’s Stars reminds us of the wonder that surrounds us—night and day. Caldecott Honor recipient Marla Frazee’s soothing graphite and gouache illustrations are the perfect accompaniment to the quiet, gentle text.... This stunning collaboration between writer and artist gently reminds us that shining stars bring beauty to the world. Stars will encourage young readers and listeners (and their parents) to gaze with new appreciation at the night sky." * "Stars. Who hasn’t looked up in the sky and contemplated their magical presence?.... The winning combination of Ray and Frazee crystallizes these ideas into a near-perfect picture book that encourages children’s minds to wander and wonder. The airy illustrations move across the pages like clouds in the sky, showing star shapes everywhere, even in strawberry plants, pumpkin vines, and snowflakes. 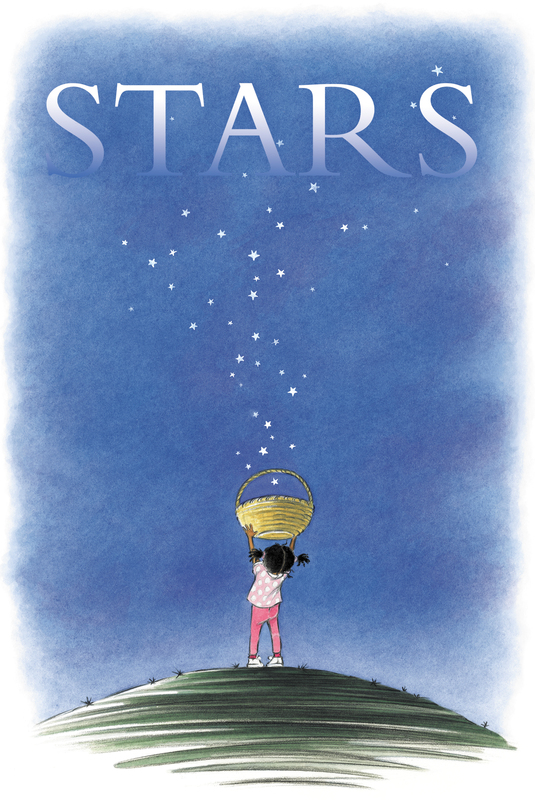 In a final message, the book asks children to remember that stars are around whether you see them or not: “Every night. Everywhere.” Lovely." "Ray’s quiet, friendly narrative begins and ends with stars in the night sky.... This contemplative book has strong adult appeal, but kids too may appreciate the spot-on portrayal of child play (sticking a paper star on a shirt to be sheriff; maniacally waving a pretend wand while making a wish; stowing precious objects in their pockets) and enjoy the lovely ruminations about nature and the night sky." "Does anyone illustrate the facial expressions, postures and movements of children with the same gloriously authentic exuberance as Marla Frazee (“The Seven Silly Eaters,” “Everywhere Babies”)? Here, a star takes many forms—in the night, on a wand, as a snowflake or in the wilds of a young imagination.... Ray (“Mud,” “Red Rubber Boot Day”) grounds her text in the everyday experiences of young children. “A star is how you know it’s almost night,” she explains. “And the dark that comes doesn’t feel so dark."" "A poetic paean to stars both real and metaphorical brings the heavenly down to readers without robbing it of mystery. Calmly and directly, Ray addresses the reader in this gentle, somnolent narrative.... Like a lulling tide, the text moves easily between grounded practical advice...and naturalistic metaphor.... Frazee excels at illustrating textual details in fresh ways, keeping young children engaged and curious.... Her pictures ebb and flow with the text, alternating charming spots of self-possessed, spirited youngsters with ink-black or gloriously blue, starry heavens inviting dreamy meditation. Ideal for bedtime, this will shine on through repeat readings." * "Mary Lyn Ray’s Stars...splendidly treats its subject with the matter-of-fact openness of childhood reminiscent of classics such as A Hole Is to Dig.... Physically, the book is a thing of understated beauty.... This is the kind of bigger-than-it-seems book that exemplifies picture books at their finest. Young dreamers in particular will appreciate the imaginative approach, and they’ll especially enjoy experiencing this fanciful rhapsody as a bedtime book—especially if shared by flashlight in the warmth of a summer night under the stars." "From tiny white strawberry blossoms in the spring to snowflakes in the winter, from the tip of a wand to the points of a sheriff’s badge, from the shape you make when you turn a cartwheel to the twinkling night lights in the sky, stars are all around us. We only have to look, this dreamy book tells us." "This ode to everything stars are (part of a wand, a pin that makes you sheriff, a sign you’ve done well) is paired with incandescent art showing the heavenly shapes in ivy, snowflakes and in your pocket—for wishing on."